Muslim Political Participation and Human Rights | This blog intends to serve as a platform to share knowledge and experiences on the political participation and the rights-based activism of Muslims in liberal democracies. This blog intends to serve as a platform to share knowledge and experiences on the political participation and the rights-based activism of Muslims in liberal democracies. Recent violent attacks on US and other Western diplomatic missions in response to a video synopsis of a film titled “Innocence of Muslims” posted on YouTube depicting the Prophet of the Muslims in blasphemous terms have reminded me of the violent uproar caused by the cartoons first published in Denmark in 2006, one of them portraying the Muslim Prophet as a terrorist. Such events ignite the perennial discussion on whether hate speech and blasphemy should be regulated. In 2006, when I was Counsellor dealing with human rights at the OSCE mission of Turkey in Vienna, Ambassador Yusuf Buluç and I have written a paper outlining our views on the topic. The following is a revised version of those views drawing on the recent developments. Before going any further, let’s be clear: violence and killing people in response to an offending, hateful and even blasphemous speech cannot be justified and must be condemned. But we have to analyze these unfortunate events and find a way to deal with them. Considering that there are various definitions of hate speech depending on national experience, the context in which hate speech takes place as well as its consequences which could potentially – I underline “potential” as distinct from US notion of “clear and present” – harm groups or individuals, become very important in determining whether to regulate hate speech. Historical evidence indicates that when danger posed by hate speech is “clear and present”, it may have been too late to deal with its consequences. Firstly, with the advent of the information society and globalized media both in terms of corporate ownership and readership, hate speech has also become globalized. That introduces a new and much larger context, necessitating a sense of greater responsibility and application of a finite judgment, not confined to a national context or territory. Secondly, since 9/11, race, gender and ethnicity have been largely replaced by religion and culture, as the most common basis for hate speech. Public discourse has been contaminated by the perceived religious threat not only against the physical safety of democratic societies but also against the values they cherish. Self-declared “cultural warriors” use thoughts to attack the perceived enemy to challenge the climate of intellectual submission and fear. They deliberately “shock, offend or disturb” the public opinion by portraying the enemy and its irreconcilable and hostile values. Unfortunately, the use of stereotypes and labelling that insult deep-rooted religious feelings do not contribute to the creation of an environment conducive to constructive and peaceful dialogue among different communities. Spirit of tolerance is also an important value, necessary in a democratic society, because it is directly related to the right to “manifest a religion or belief in observance or practice”, thus personal fulfilment of individuals. If we lose this spirit, proposing a constitutional amendment to ban the construction of minarets, as happened in Switzerland, becomes possible and even acceptable. Thirdly, one should also think in terms of the possible consequences of allowing hate speech in a certain context particularly in times of heightened sensitivities and inter-communal polarization. Under these circumstances, the impact of ideas, acts or manifestations that are offensive, degrading or provocative against certain groups is qualitatively different simply because they feed into and reinforce already existing misperceptions, grievances and marginalization, thereby increasing rather than decreasing fear. So the context and the possible consequences, which potentially harm social coherence and harmony, are extremely important. In a society where racist and xenophobic elements in public discourse have almost become mainstream, the line to be drawn between free speech and hate speech becomes even more important and consequently grey areas less affordable politically. Hate speech, if not checked can unleash violent conflict, and historically has proven its capacity to trigger genocides. Now the question is who should draw the line? The ECtHR’s assessment is always made in regard to a State’s specific interference with the right to freedom of expression. Danish Director of Public Prosecutions stated in his decision on “Prophet Cartoons”, “it is not possible from the case-law of the Court to infer a certain state of law regarding how the Court would weigh the regard for freedom of expression in relation to expressions that can offend religious feelings.” This statement, I believe, constitutes a testimony to the fact that there is a gap in European case-law on how to deal with instances in which states do not interfere to resolve cases of conflict between freedom of expression and “rights of others”, in particular the right to respect for one’s religious feelings. The Court, in its judgement in Wingrove vs. the UK, established that “a wider margin of appreciation is generally available to the contracting States when regulating the freedom of expression in relation to matters liable to defend intimate, personal convictions within the sphere of morals or, especially religion”. All in all, I find the case-law of the Court on blasphemy which leaves a wide margin of appreciation to the Member States as wise in the current state of our democracies. The State authorities and national judiciaries, as opposed to the ECtHR, are rightly assumed to be in a better position to decide, within the margins set forth by the Convention and other binding international law provisions, on the nature of the pressing social needs such as protecting the rights of others or preventing disorder. So the question is what if a State is reluctant or unable to fulfil its positive obligation to holders of religious beliefs under law because of its political or legal traditions and circumstances? In light of the foregoing, drawing the line requires fine judgements both by the lawmakers and the courts. When striking the right balance, careful consideration should be given to extending the same protection to all communities from incitement to hatred and blasphemy against their religion. This is a crucial requirement for a just and inclusive society. The victims of hate speech may interpret indifference of the authorities as tacit approval of their denigration. This in turn would seriously jeopardize their sense of justice, thereby weakening their allegiance to the society in which they live and undermine the grounds and urgency for their integration. Decontextualizing rights and their implementation leads to an unbridgeable gap between our perceptions on “what is necessary in a democratic society”. To be able to interact and build shared values, we need to rely on overlaps in our thinking and analysis. Regardless of whether or not hate speech is regulated, acts and manifestations of hate should be countered by a timely and responsible public discourse that rejects hate and promotes mutual respect and understanding. Political leadership is particularly required to lead this kind of public discourse. On the other hand, public authorities have a special responsibility to refrain from statements, in particular in media, which may reasonably be understood as hate speech. Hate speech is a complex phenomenon and it would be insufficient to address this problem with merely legal or political measures. Hate speech is only one type of manifestation of intolerance. Intolerance has deep roots in society. Therefore, human rights and tolerance education, which promotes respect for inherent dignity of all human beings as well as for cultural and religious diversity, is essential. Media professionalism and responsibility should also be promoted by the media itself. My experience as a diplomat who has long been engaged in the intergovernmental human rights network leads me to conclude that there is neither sufficient collective political will nor much prospect for a consensus to reconcile freedom of speech with other attributes of a democratic society, in particular respect for cultural and religious diversity, and thus ensure their enduring complementarity. Therefore, while a healthy debate may continue to flourish in the academia, but alas in the intergovernmental human rights network, existing body of international standards and principles regarding freedom of expression are seen to be sufficient and regulating hate speech remains to be a quasi taboo. There is the vain, almost arrogant expectation that the problem will disappear with the frequency of sermonizing about freedom of expression, like the number of injections of preventive medicine. Nevertheless, international standards and principles just like national laws are subject to scrutiny and review by their parties and adherents with a view to identifying and filling the gaps, where they exist, particularly in light of new developments as a function of societal and political dynamics. Although hate speech and blasphemy are two different concepts, there are overlaps between them in practice. Vilification of religious beliefs may sometimes be related to incitement to hatred. A hate speech may denounce particular beliefs and give this as a reason for hatred. Therefore, protection against blasphemy is equally needed for all faith communities coexisting in increasingly plural societies. The European Court of Human Rights, reasoning along the same lines in Otto Preminger Institut v. Austria, considered that “… respect for religious feelings of believers … can legitimately be thought to have been violated by provocative portrayals of objects of religious veneration and such portrayals … can be regarded as malicious violation of the spirit of tolerance which must also be a feature of a democratic society…”. First, I argue that a Human Rights Framework (HRF) can facilitate political interactions between Muslim representatives and host country authorities because it provides them with a common language essential for a democratic dialogue. Along the same lines, the Parekh Report on the future of multi-ethnic Britain advocated twelve years ago that the negotiations over contested issues of diversity such as school curriculum or religious attire in public space require “ground rules that provide a minimum guarantee of protection for individuals and a framework for handling conflicts of interest”. The Report further argued that “such ground rules are provided in part by international human rights standards”. I believe that the developments after the publication of this report have reconfirmed the validity of the case made for human rights as ground rules for political engagement with groups holding particular cultural and religious practices at the centre of their identity. Second, HRF can help broaden the terms of engagement with Muslim communities beyond the security agenda and enhance their sense of belonging. In the wake of 9/11 and subsequent terrorist attacks, governments’ willingness to engage with Muslim communities mainly in the context of counter-terrorism continues to weaken rather than strengthen the support expected of the communities for counter-terrorism policies, such as “the Prevent” agenda in the UK or “Islam Conference” in Germany. This is mainly because Muslims in the West often feel that they are boxed in a religio-security context. It is therefore necessary to broaden the terms of engagement beyond the security agenda to show that Muslims are not simply potential terrorists but individuals and citizens with inalienable civil, political, social and economic rights. Third, HRF facilitates recognition of multiple identities of migrants, thus widening the opportunities for their participation that are not solely as Muslims, but also through mainstream organizations. Since 9/11, as a result of threatening circumstances and adversarial politics, religio-cultural identity has resurfaced and overshadowed other layers of immigrant identity such as ethnicity (1990s) and ideological orientation (Cold War). Islam today plays a key role for European Muslims, both as an identity marker and as a mobilizing force around which diverse individuals can rally. However, although migrants (or “guest workers”) turned into “Muslims”, they continue to have multiple identities. Because of the alleged link between Islam and terrorism, policies of engagement with Muslim communities emphasize and encourage participation with Muslim identities. Ironically, this restrictive approach empowers the most radical groups who are more prepared and organized than moderate and secular Muslims to mobilize around political and religious issues. Mahinur Özdemir, a Humanist Democratic Center (CDH) Deputy of Turkish descent who was elected to the Parliament of the Brussels-Capital Region in regional elections held on 7 June 2009, became the first headscarved deputy in Belgium. In this context, specific needs and concerns of female Muslim migrants who encounter multiple barriers both within and outside their communities to participate in public life can be addressed more effectively in the human rights framework. Tensions on private matters related to family law such as forced marriages, divorce and custody of children require nuanced responses developed together with community representatives based on universal human rights principles, rather than introduction of parallel legal systems based on sharia law. Fourth, a dialogue with Muslim immigrants based on HRF empowers them because the liberal state is under legal and political commitments both at the national and international levels to respect and protect human rights of all persons under its jurisdiction, including non-citizens. History of the impact of migration on the legal system of liberal states demonstrates that disputes about migration have played an essential role in spreading human rights. Standards of rights protection to all persons, regardless of their status, are considered central to states’ democratic self-image. However, there is now an extensive literature which documents restrictions imposed upon migrants’ basic political and civil rights. Human rights of migrants remain low on the international human rights agenda. The 1990 UN Convention on the Protection of the Rights of Migrant Workers, one of the 12 core international human rights instruments, has not yet been ratified by any of the Western liberal states. If representatives of Muslim communities organized in civil society are supported and trained to make their cases in the context of human rights law and policies, it would allow them to effectively communicate their demands to the authorities and to the mainstream society, and if justified, receive political attention and visibility to address their concerns. Many Muslim NGOs are now using both national and international human rights platforms to publicly hold the states accountable regarding the lack of implementation of the commitments they have undertaken. The “boomerang effect” coined by Margaret Keck and Kathryn Sikkink in “Activists beyond Borders” (1998) is also at work for Muslim advocacy groups today. Through human rights advocacy based on research about the communities, they are able to convey their views as well as their demands and recommendations to the states in an increasingly effective way. Should the States remain indifferent to their demands, groups in one country appeal to citizens of another through transnational advocacy networks in domestic and international politics; these citizens pressure their own government to pressure the indifferent offending State. Fifth, HRF can assist the liberal state to address cultural and religious demands of Muslim communities in a secular context. Muslim communities are generally believed to pose new challenges to liberal nation-states. Nevertheless, the Gallup surveys demonstrate that Muslim communities rarely contest and highly praise the secular nature of the liberal state in which they live. The Declaration adopted by the Conference of “Heads of Islamic Centers and Imams in Europe” in Graz on 15 June 2003, calls on Muslims in Europe to “demonstrate loyalty to law and constitutional principles also as regards the secular structure involved”. In search for a deeper sense of spirituality, however, Muslims demand redefinition of the boundaries between the public and the private. In such processes, Seyla Benhabib argues, the “ground rules” in the form of basic rights and liberties cannot be transformed and abrogated by majority; however, they should be constant subject of deliberation, contestation and negotiation. Sixth and final hypothesis I put forward is that speaking human rights language in the interactions between Muslim immigrant representatives and the institutions of liberal states would further encourage and contribute to the ongoing interpretation of the Islamic law and practices in a way that would be compatible with international human rights law. International human rights law, negotiated for decades among nation-states, constitutes a platform of shared values. Furthermore, it is generally in conformity with the basic tenets of all the major religions. Susan Waltz’s research on the participation of Muslim countries in the creation of the Universal Declaration of Human Rights shows the important substantive contributions made by Muslim representatives. A leading thinker in human rights from outside the Western tradition is Abdullahi An-Na’im. Committed to international human rights and of the Islamic faith, An-Na’im argues that “(Muslim) human rights advocates must work within the framework of Islam to be effective… [and] should struggle to have their interpretations of the relevant [Islamic] texts adopted as the new Islamic scriptural imperatives for the contemporary world.” He urges human rights advocates to claim the Islamic platform and not to abandon the field to the fundamentalists. An-Na’im is certainly not alone in his endeavors to reconcile Islamic teachings with secular human rights norms. Shirin Ebadi’s and Abdulkarim Soroush’s work on freedom, democracy and human rights are but some other prominent contemporary examples of “translation” of the concepts and criteria of one culture into another. Ahmed, Nafeez Mosaddeq, “Toward a Holistic Strategy to Counter Violent Radicalization in the United Kingdom”, IPRD Report, August 2009, p.4. Hans-Christian Jasch, “State-Dialogue in Italy and Germany for Promoting Integration of Muslims”, Turkish Policy Quarterly, Winter 2006/2007 (Volume 5, Number 4), pp.4-7. One of the working fields of the Conference, designated by the Federal Minister of Interior, has been “Security and Islamism”. Nebahat Albayrak (then MP for the PvdA), “Downgraded Migrant Tired of Exclusion”, Volksrant, 13 March 2006, p.7. Gökçe Yurdakul, From Guestworkers into Muslims: The Transformations of Turkish Immigrant Associations in Germany, Cambridge Scholars, 2009. Bhabba, Jacqueline, “The Impact of Migration on the Legal System of Western States”, International Migration and Security: Immigrants as an Asset or Threat? (Routledge Research in Transnationalism) by Elspeth Guild and Joanne van Selm, 2005, p.28. Mogahed, Dalia, “Ordinary Muslims”, Gallup Special Report, 2006. Ann Elizabeth Mayer, Islam and Human Rights, Fourth Edition, Westview Pres, 2007, p.13. A strong theme in the literature on Muslim political participation is the insufficiency or ineffectiveness of mainstream channels for non-citizens to participate in politics and the potential for consultative bodies and civil society organizations, to serve as viable alternatives. However, the consultative bodies have very limited advisory powers and have no true decision-making competences. Migrant communities generally perceive these fora targeting exclusively at migrant or Muslim issues as ineffective. They caution against “tokenism” and rigid institutional designs which may reinforce and not reconcile ethnic and religious differences. Instead, they ask for “deliberative forms of democratic dialogue”, essentially based on power-sharing in a society. State authorities, however, prefer a single, authoritative and representative voice of Muslims to pursue dialogue, which is difficult to attain considering the diversity of Muslim groups in liberal societies. In short, political interactions between immigrant organizations and state authorities in the context of consultative bodies have yet to yield mutually satisfactory forms of dialogue. Muslim civil society organizationsconstitute an important tool for the integration of migrants into political processes since they are instrumental in voicing migrants’ demands and concerns. An overview of recent integration literature in Europe highlights the growing relevance of migrant-led associations and their political function in terms of democratization. Gathering together politically engaged, religious Muslims, these organizations may be effective mediators with government authorities and can potentially contribute to better integration outcomes. They can also play a crucial role in addressing structural discrimination and institutionalized racism which present obstacles for participation. In this context, it is my contention that should these associations be provided with resources and training for capacity building, they not only can introduce and challenge Islam related questions, but also play a critical role in “translating” ethnic, religious or cultural demands and grievances, if any, into a political discourse relevant for the mainstream society. For that, however, they need a common language and framework of references, in other words, “ground rules” of political interaction. That language and framework, I argue, should be human rights. I will explore in the next post why and how. Faist, Thomas (2009) “Beyond a Methodologically Nationalist Perspective on Civil Society”, Turkish Studies, 10: 2, 317-318. Fennema, M. & J. Tillie (2001), ‘Civic community, political participation and political trust of ethnic groups’, Connections 23 (2): 44-59. Why Muslim Political Participation should be a concern for Liberal States? Democratic legitimacy requires equitable participation of all groups in public life. The contributions of legally residing Muslim immigrants, at least as taxpayers, to a country’s prosperity justify their right to influence public debates and political decisions in the country of their residence. Participation in political movements, trade unions, NGOs, representation by media and access to national human rights institutions are a part of Muslim immigrants’ ability to influence decision-making processes at political and societal levels. Social tensions arising from the exclusion of Muslim immigrants from the benefits of society exist in many countries. Failure to deal adequately with these tensions can lead to further isolation and deprivation, which can in the end provide a breeding ground for crime and violence. A policy based on integration which respects the Muslim immigrants’ right to maintain their own identity, as distinct from policies based on assimilation or separation, is likely to be the best way of avoiding tensions. The aim of integration should be a State which all groups consider their common home where all have equal opportunities to participate. Participation, therefore, is a key pillar of integration. First, liberal societies today are hosting, along with national citizens, the people with different legal status such as guest workers, long-term residents (or denizens), asylum seekers and undocumented migrants under the same democratic roof. All these groups of people, because of their legal status, are subject to different sets of rights and obligations. The Muslim immigrant can belong to any of these groups. I assume that human rights can positively affect political participation of all of these groups, but especially those who are more vulnerable because of their legal status. Second, by “political participation”, I mean a broad range of activities which give voice to societal concerns and may include both conventional/electoral (voting, running for election, campaigning for a candidate) and less conventional/non-electoral (voluntarism or participation in interest or civil society groups, engagement in policy development through activism, public consultations or lobbying etc.) types of political activities. Third, political participation depends, to a certain extent, on migrants’ backgrounds and on the political opportunities provided by the host society. However, recent research challenge the conventional wisdom about the defining impact of the political opportunity structures and introduce new factors, such as culture, threatening circumstances or adversarial politics, influencing the level of immigrant political mobilization and participation. Fourth, when I use the term “Muslim”, I refer to an individual who religiously, culturally or otherwise have no problem in being identified as “Muslim”, even if he/she may not personally see the Muslim layer of her/his identity as the dominant one. Studies on Muslim immigrants find significant diversity, plural views and identities in flux. “Muslim” is also a salient political category around which political mobilization takes place. Fifth, most of the basic challenges and opportunities citizens face in political participation are also applicable to the Muslim immigrants, except for cases in which they are denied participation such as voting or eligibility at the national level. In other words, recent research no longer supports the long-time dominant theory of “political apathy of immigrants”. Finally, by “human rights”, I mean the law, the practice and the policy of human rights. I am aware of the fact that for some Muslims residing in liberal societies, “human rights” may represent a political agenda with which they refuse or are reluctant to interact. My main concern here is to identify possibilities of interaction with the Muslim immigrants who emphasize “change through religiosity and rights”. Understanding their experience which allow for the practice of human rights without abandoning religion can contribute to both theory and policy development in order to address the challenges faced by today’s multicultural liberal democracies. Such as political ideas and values, previous involvement in politics, institutions of immigrant community, identification with the host society, knowledge of the political system and its institutions, social capital and density of immigrant associational networks, education, linguistic skills, socio-economic status, gender, age or generational cohort. Such as voting rights, access to citizenship, freedom of association, representation of migrants’ interests, institutions for consultative politics, presence of laws and policies related to equity, anti-discrimination or inclusion. Marco Martinello, “Political participation of immigrants in the EU”, Equal Voices, Issue 20, December 2006, p.15. Rainer Bauböck and Marco Martiniello, Ed., “Migration and Citizenship: Legal Status, Rights and Political Participation” State of the Art Report for IMISCOE”, pp: 56-8. Securitizing Islam or Empowering Muslims? Growing immigration flows and resulting cultural and religious diversity in society have been posing serious challenges to the liberal nation-state. One of these challenges is to reconcile the need to preserve national cohesion with the commitment to universal human rights and respect for diversity. These challenges have become more visible and more complex to deal with in public discourse and policy, ever since the security dimension gained prominence. Since 9/11, the States in Europe embarked on a dual-track policy of hardening immigration and asylum procedures on the one hand, while actively engaging with Muslim immigrants to accelerate their integration on the other. The need for an urgent dialogue has both facilitated political mobilization of Muslims and opened up new avenues for their political participation. Due to lack of mainstream channels for non-citizen participation, consultative bodies and migrant-led organizations have emerged to serve as alternatives. However, political interactions between Muslim immigrant organizations and State authorities have yet to yield mutually satisfactory forms of dialogue. Among other problems, Muslim migrant representatives are often misplaced and boxed into a “religio-security” context. The new polarization in society along religious/cultural lines, coupled with trivialization of intolerant public discourse and acts of racism and xenophobia, has unleashed dynamics that can potentially undermine the spirit of tolerance necessary in a democratic society. The core challenge remains whether the Liberal State can and is willing to accommodate the political demands expressed by the Muslims in Europe despite the fact that they were not a part of the historical compromises made with the religious establishments. These demands are widely perceived as running counter to the “depolitization of religion” that had been occurring in Europe for nearly a century. Therefore, a genuine dialogue with Muslim communities in Europe at the level of civil society is a crucial task for the 21st century. This collaborative blog will aim to explore whether human rights can facilitate the political interactions between Muslim organizations and host country authorities in Europe by providing a common language and framework. Can human rights framework empower Muslims in this dialogue? 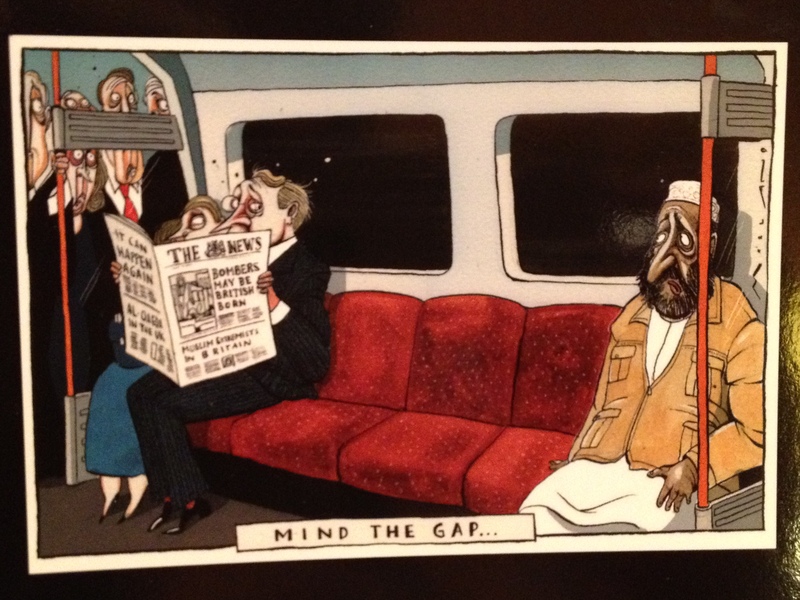 Originally published by Morten Morland in July 2005, “Mind the Gap…” satirizes the kind of paranoia prevalent in some countries during a period in which public perceptions of British Muslims were significantly affected by the attacks of 7 July. Welcome to my blog! I am a Ph.D. candidate and a diplomat. The views expressed in this blog are mine and do not necessarily reflect the opinions of the institutions I am associated with.